For the first time in recorded history, a Category 4 hurricane is striking the Florida Panhandle. 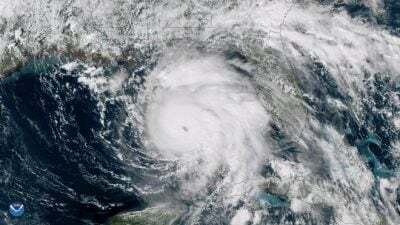 Hurricane Michael made landfall today, packing winds of 145 miles per hour — strong enough to collapse houses and cause massive damage to other infrastructure. Forecasts have also warned of a storm surge that could reach a stunning 14 feet in height. The storm is powerful enough that it will remain a hurricane long after it is far inland: Models show it will still have hurricane-force winds by the time it reaches as far inland as Albany, Georgia. Experts are warning that damage is expected to be “catastrophic,” and rainfall of up to half a foot could be dumped across much of the Carolinas, which are still recovering from Hurricane Florence. Truthout has reported repeatedly on how human-caused climate change is super-charging the amount of rainfall potential for hurricanes. The current storm is displaying what scientists have been warning us about for years. NOAA’s Geophysical Fluid Dynamics Laboratory has been warning us for years that human-caused climate change would increase key variables of hurricanes, including wind strength, the amount of rainfall, and storm surge levels. The lab’s main conclusions on “detectable” changes are clear: Sea-level rise should be causing higher storm surge levels, rainfall rates will likely increase, tropical cyclone intensities around the globe will increase, and the proportion of storms being either Category 4 or 5 will increase. Meanwhile, Florida Governor Rick Scott, who made a name for himself as a world-class climate change denialist by forbidding state employees from using the words “climate change” or “global warming,” is warning state residents of the ferocity of the current storm. Last year, the Tampa Bay Times reported that Gov. Scott’s personal investments in the energy industry actively helped shape Florida’s lack of adequate policies towards dealing with climate change impacts. The report showed how parts of Gov. Scott’s quarter-billion-dollar fortune were invested in petroleum and power-generating companies that are directly opposed to restricting greenhouse gas emissions, as well as environmental regulations. More importantly, given his denialism, Gov. Scott has not committed state resources to relocating people in flood zones, or preparing communities for storms like Hurricane Michael. Given that we know human-caused climate change impacts will only continue to intensify from now on, and damage from hurricanes such as this one will increase right along with them, Florida is the micro of the macro of a country led by a climate change-denying president. Featured image is from Live Science.